Before the storm blew up this afternoon, two of us went for a stroll in Marlay Park on the edges of Rathfarnham and beneath the slopes of the Dublin Mountains. I am blessed to live in a part of south Dublin that offers access to so many open areas of parkland, including Airfield, Saint Enda’s Park, the grounds of Rathfarnham Castle, Tymon Park and Marlay Park. I can understand why so many of the residents of this part of Rathfarnam complain during the summer months about the noise and behaviour connected with late night concerts. But those concerts have paid for the restoration of one of the architectural gems in Marlay Park. Generations of children have passed by a tumbledown that they have often known as “Goldilocks Cottage,” teased by parents to peer at the windows from a distance to see whether they can catch glimpses of the Three Bears. Immediately adjoining the courtyard is an enclosed garden of some four acres with a head gardener's house. The charming, hidden cottage known as Laurelmere Lodge is in a shaded corner close to a little wooden bridge that easily provide the location for Christopher Robin playing Pooh-Sticks … I can just imagine the children crossing this bridge looking out for Winnie the Pooh and Eeyore. For years, this two-storey cottage was shaded by overgrown, overhanging trees, and had fallen into a sad state of disrepair. Marlay House is an 18th century Georgian house once owned by the family of David La Touche, the first governor of the Bank of Ireland. Laurelmere was originally built around 1790 a thatched cottage orné or stylised cottage built in a rustic setting for the La Touche family. The La Touche family would have used the cottage as a place for picnics, card games and theatricals, according to Pamela O’Connor, a conservation architect with Dún Laoghaire Rathdown County Council. Later, the cottage was remodelled with a slate roof in the Art and Crafts style around 1875 by its next owner, Robert Tedcastle. Two rooms were added on upstairs and a slate roof in the Arts and Crafts style was added. At the time, the estate manager for the Tedcastle family lived in the house at this time. Later, it was also known as Tamplin’s Cottage after a one-time resident, Colonel Bob Tamplin, who was the Captain of nearby Grange Golf Club in 1925. From 1925, Marlay House and estate was owned by the market gardener Phillip Love until it was acquired by Dublin County Council in 1972. The last tenant of Laurelmere Cottage moved out in the mid-1970s, and the cottage remained vacant for another three decades and was falling into ruin. But it continued to hold a fairy-tale, romantic fascination for children – and adults – in the woods of Marlay Park. “Attempts were made to stop the rot in the 1970s and structural work was done to hold the building in its place in the 1990s, but it was never a priority,” according to Michael Church, the heritage building manager at Dun Laoghaire Rathdown County Council. 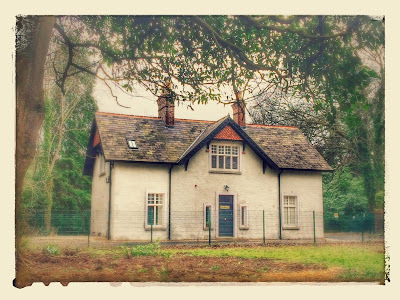 The cottage has been restored in recent months by the Architecture Department of Dún Laoghaire-Rathdown County Council as part of the restoration of Marlay Park. The restoration has cost €536,000, and this been funded by the monies raised from the Marlay Park concerts. Pamela O’Connor and Alyson Carney oversaw the recent restoration works on Laurelmere. This restoration work was carried out by master craftsmen Dunwoody and Dobson, who worked in the Arts and Crafts style, reusing original stone-tiled flooring, wood panelling, tasteful light fittings and cast iron fireplaces. Now it has become the premises of the Royal Horticultural Society of Ireland, and will be home to the RHSI garden school and a horticultural programme run by gardening lecturer Ciaran Burke. More than 500 people saw the interior of Laurelmere last October as part of Open House Dublin last year. I walked around the cottage this afternoon, peering through the windows at the two reception rooms downstairs. Upstairs, there is space for a boardroom, a library with more than 1,000 gardening books, and the Garden School office. The cottage was closed this afternoon, but I understand reproductions of William Morris floral printed wallpapers – popular during the Arts and Crafts movement – have been used throughout the house. Paint colours used during the late 1700s, when the cottage was first built, have also been replicated. The garden to the front of the house is to be used by the garden school and there are plans for a naturalistic style garden to the back, with seating for adults, play space for children and perhaps sculpture exhibitions. However, plans to reinstall the original conservatory have been put on hold due to a lack of funding. We strolled through the Saturday farmers’ market in the courtyard, where we bought a little taste of Greece in the shape of olive produces from Greece. Later, we had double espressos in the coffee house beside the walled gardens, before moving into the walled regency gardens, with its hidden delights. Before we left, a proud peacock was preening himself on a table in the small walled area behind the coffee shop, obviously used to the attention of customers and visitors and not afraid of their proximity. Back in the main courtyard, the blustering winds were blowing through the stalls, announcing the storm was imminent. Perhaps the peacock alone would remain unperturbed. But I was reminded that the peacock was a mediaeval symbol of the resurrection. Lent finds its climax not on Good Friday but on Easter Morning.